The Green Girl purchased a Good Hope Workout Sports Duffel Bag after winning not one but two CSNStores.com blog giveaways from Tiina from One Crazy Penguin and Tim from 26.2 Quest. I had been wanting to get a new duffel bag since I started working out at the gym at my work. I'm a cheap Green Girl so I wanted an inexpensive, lightweight yet sturdy, compact bag but I wanted a separate shoe compartment. 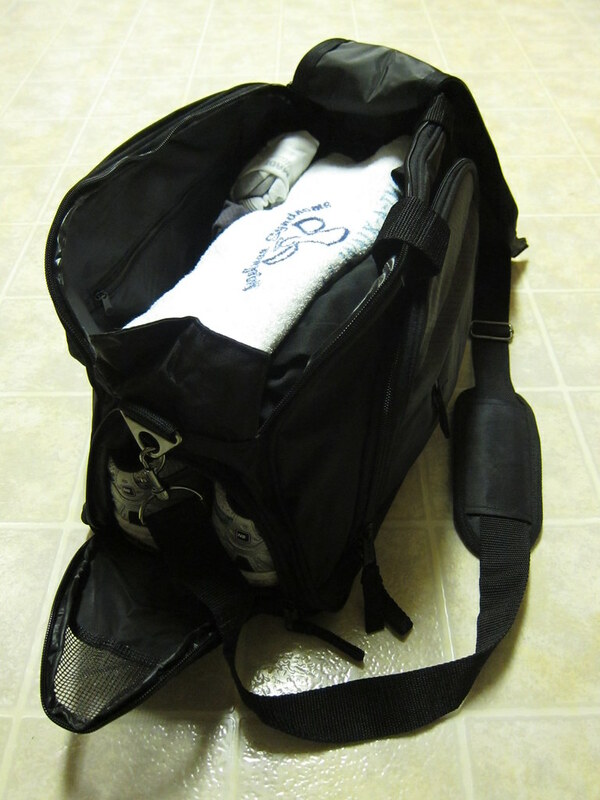 I liked that the Workout Sports Duffel Bag's dimensions were 10.5" H x 17.5" W x 9" D and it only weighed 1.66 lbs. The bag is constructed of 600d rip-stop polyester and 420d nylon twill. The main compartment is lined and contains one inner zip pocket. The bag is surprisingly well made. The zippers open and close easily and feel sturdy. 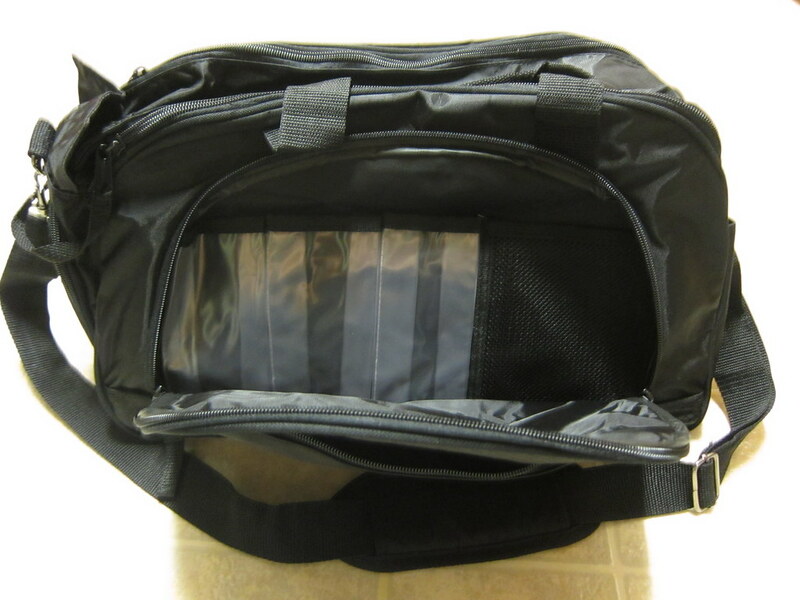 The front of the bag features a zippered flap section. When unzipped, there are three plastic pockets that expand and a mesh pocket. The pockets are not large enough for standard sized shampoo/conditioner bottles but they would be perfect for smaller bottles. Deodorant would fit perfectly in one of those pockets. 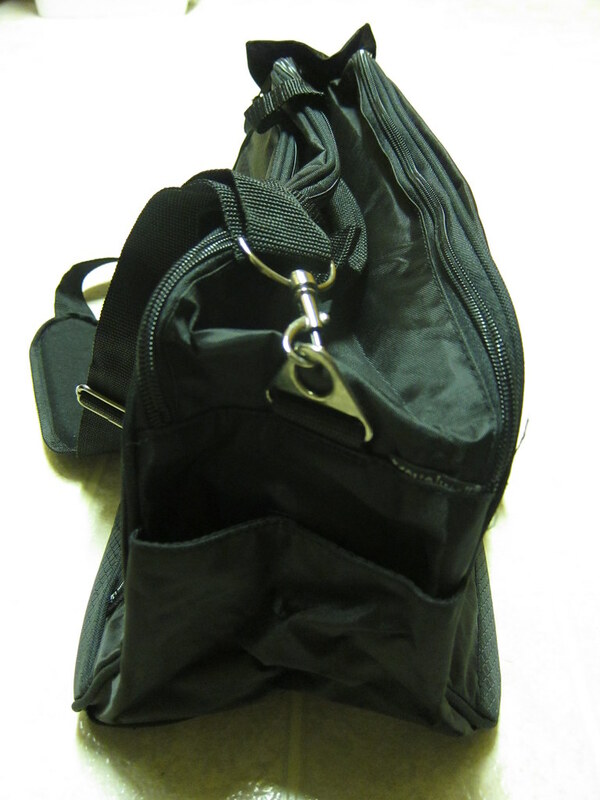 The vented shoe pocket is on the left side of the bag and on the right is a small pocket with a Velcro fastener. The duffel comes with a detachable, cushioned shoulder strap but it does not have feet at the base for additional protection. The Workout Sports Duffel is the perfect size for hitting the gym after work. The compact size allows me to easily carry it along with my laptop and purse. Despite its size, it's surprisingly spacious. With my bulky running shoes in the shoe pocket, it easily fits two sets of workout clothing, a baseball cap, a jacket, and small towel. The dual-zippered top flap opens and closes easily and is secured by a small Velcro flap at the end. I am very pleased with the Workout Sports Duffel Bag! Nice Review. And how lucky of you to win 2! A good workout bag is very important to me. Thing is, now I've got so many "work-out" bags, it's kinda crazy. 3) hydration stuff "work-out" bag. 4) Weight training "work-out" bag. 5) First aid "work-out" bag. 7) Misc.-work-out-clothes-that-don't-fit-in-the-dresser drawers "work-out" bag. Of course, I only carry one with me But . . . LOL. Don't go my route. It will drive you looney. I only had two workout bags - one is dedicated to kickboxing and one is an 'all purpose' bag. I was using the 'all purpose' bag but it's huge and it was really awkward to carry it along with all my work stuff. It was also way too bulky for the gym lockers. This bag is perfect for locker storage and so much easier to carry to the office. A cheap green girl is a smart green girl! Glad you like your new bag. My current bag is falling apart, so this was timely! It sounds great and you spent your CSN cash wisely. What a lucky green girl you are - 2 wins!! Glad it worked out for you! I love it when a new item works itself nicely into my routine. Hate it when I buy something and find out it doesn't quite fit my needs. I've abandoned 2 perfectly good duffles because they weren't perfect, but my third was the charm. It would've been nice to try them out for "free".